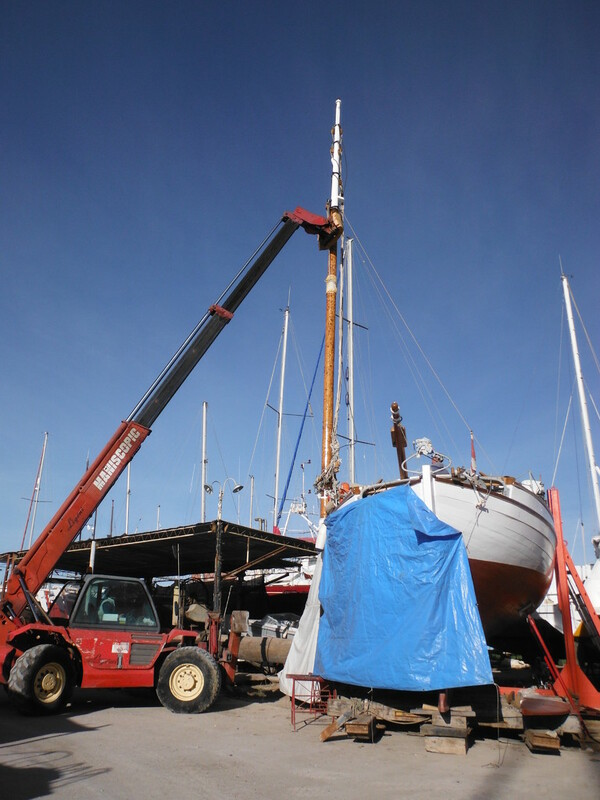 The biggest yard job this year was to take the mast out for some thorough maintenance instead of the yearly one coat of varnish/paint/oil from the bosun's chair. 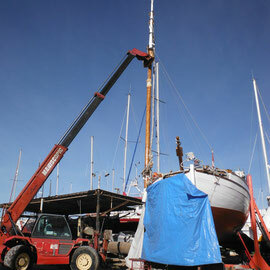 When modern boats have their masts unstepped it's an hour's job, more or less, or anyway it looks real quick. 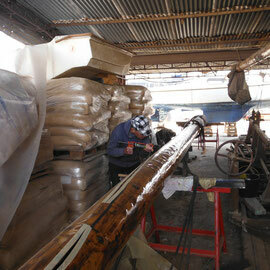 We took several days preparing everything! The belaying pins and navigation lights are attached to the stays so they had to come off. 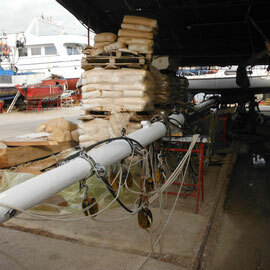 The lazy jacks are spliced in so we had to unsplice them. There are no clip-on hanks for the staysail nor a slide in the mast for the mainsail; instead it meant cutting and undoing a lot of rope. 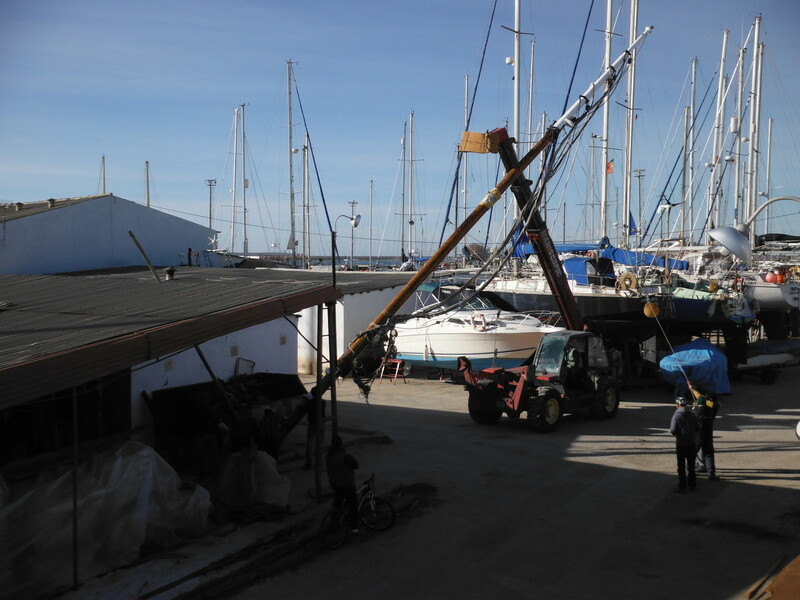 Then where to leave the sails and boom and gaff? 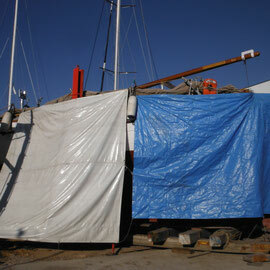 A 50 m2 mainsail is a hell of a big and heavy lump. We labeled all the halyards and stays and I took loads of pictures of how everything was positioned – a good thing too, because when everything was horizontal it was just spaghetti and when everything was mounted again there were several blanks in our memory. 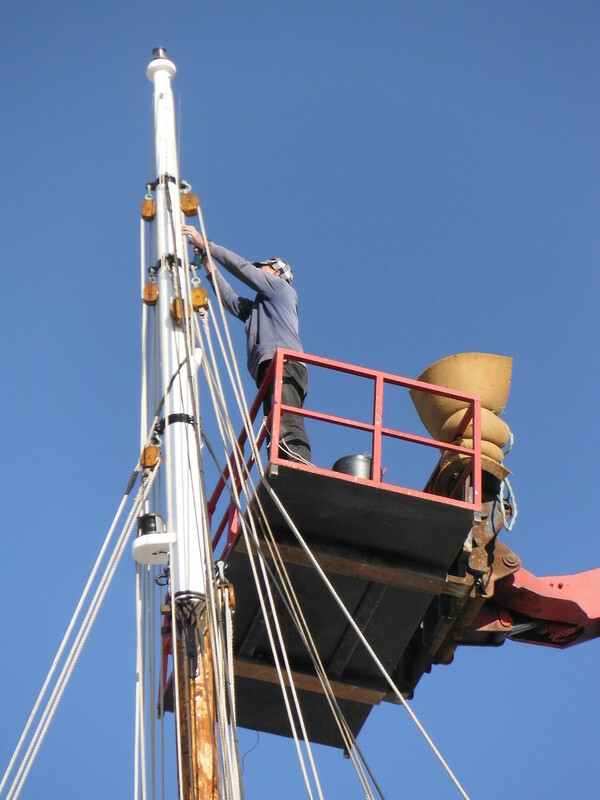 Anyway, it had been ten years since the mast was stepped and now we hope not to have to unstep it again for the next ten years. 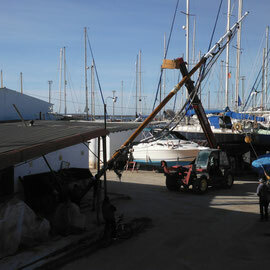 The yard provided a nice place for the mast under the roof of the saw machine shed. 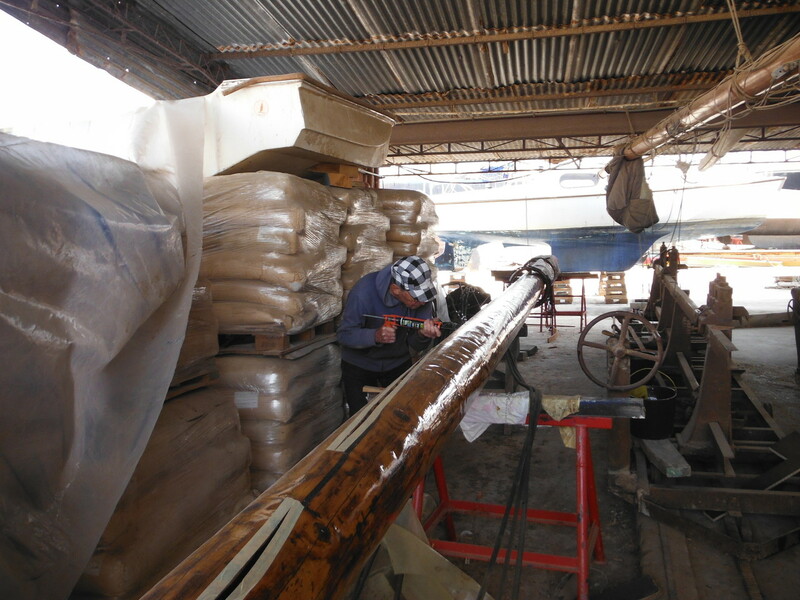 A wonderful place out of the sun and rain, however very dusty when sawing or planing was done, so the varnishing I did on Sundays and sometimes in the evenings. 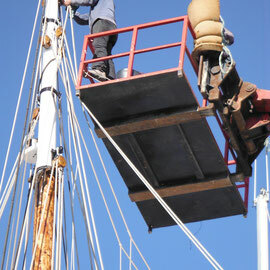 The mast had alway had some shakes (cracks, for ye landlubbers / NL: windscheuren) and by now, after several years in the South, they had opened quite a bit. 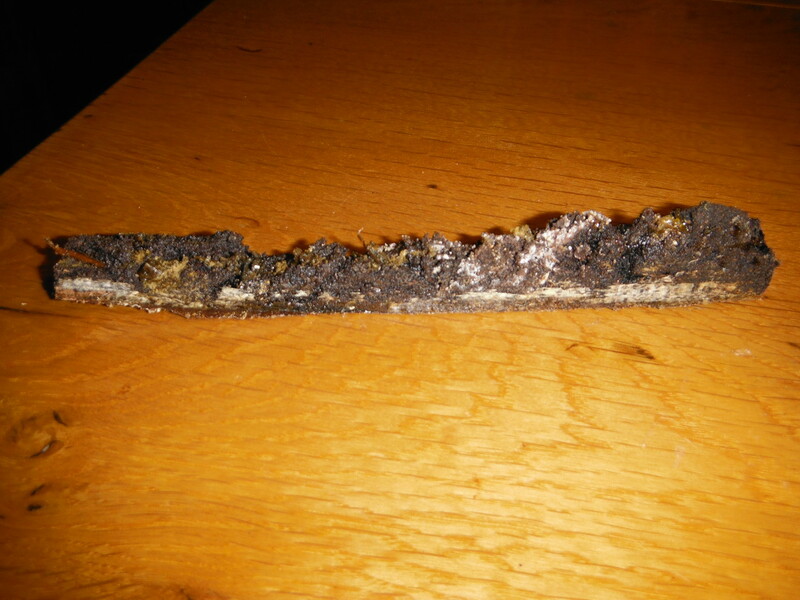 We had used “harpuis” (I can't find a translation anywhere) in the seams, this is some sort of resin, solid, which has to be made liquid by boiling it in linseed oil before pouring it in the cracks on a hot summer's day. And yes, bit by bit, on just normal summer days in the South, sticky drops had fallen out. 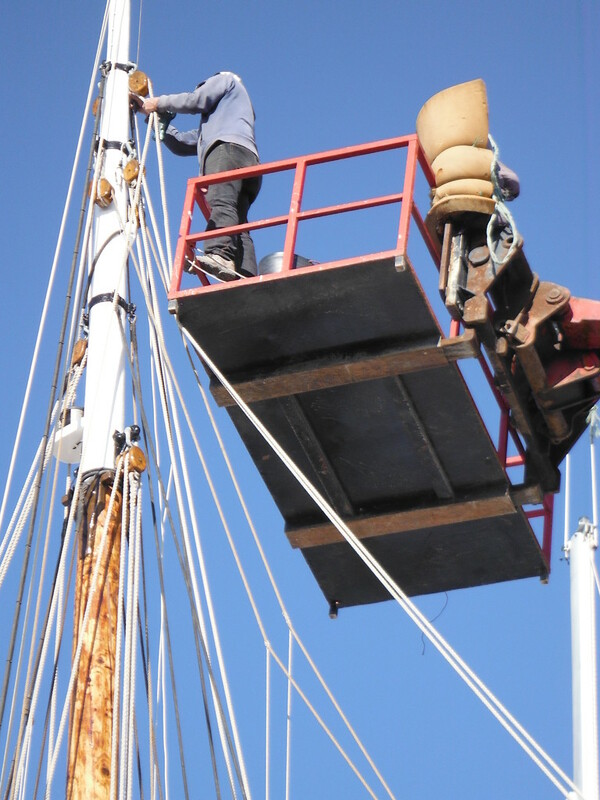 In the Netherlands we'd been assured by a mast maker not to worry about the shakes and so at first we'd thought to just treat them with linseed oil, but from various sides we were advised to glue them, which is what we decided to have done. 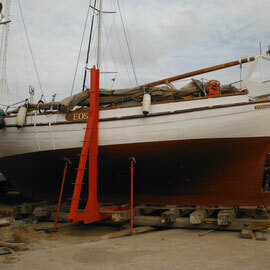 At first it looked really nice to have them filled and even quite natural to have those black strips, but some ten days later, as I was sanding the mast for the last coat of varnish – while thinking how nice it was going to be in the water again in a week's time – I noticed several horizontal splits in the glue and even some parts where the glue was coming all undone! Several days were spent of breaking our heads, listening to suggestions and spending hours and hours on internet doing “research” for an alternative. Even the S-word was mentioned! 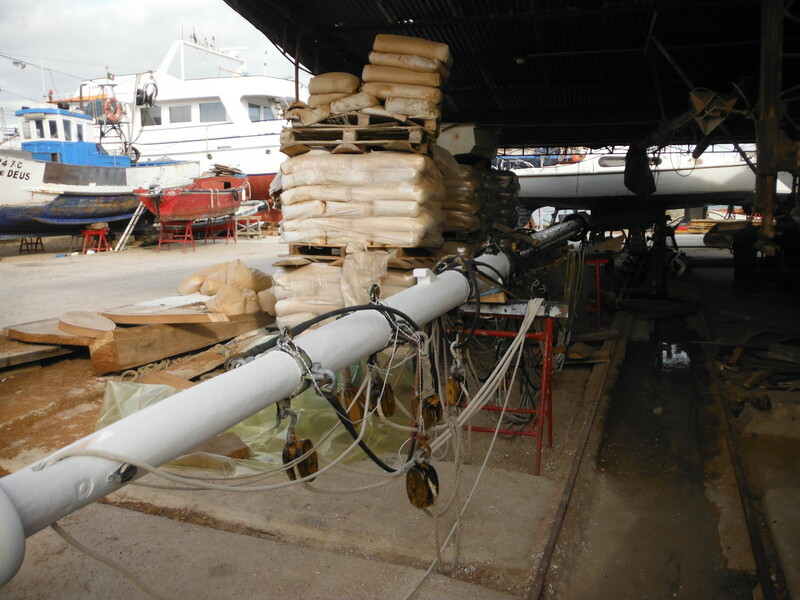 We'd always sort of prouded ourselves on having no sikaflex anywhere on the boat, however after studying all the product data sheets it does seem that sikaflex maybe might be suitable for some things. However, we found a reason for not to become converts! 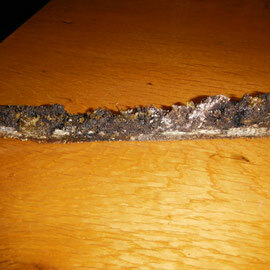 : sikaflex, except for the type used in teak decks, is not UV-resistant. So we settled for a MS Polymer; this of course is also a matter of fingers-crossed, because there are several makes and types, but we just chose the type available at the hardware store here, and they even had it in brown. Meanwhile it had started to get winter. 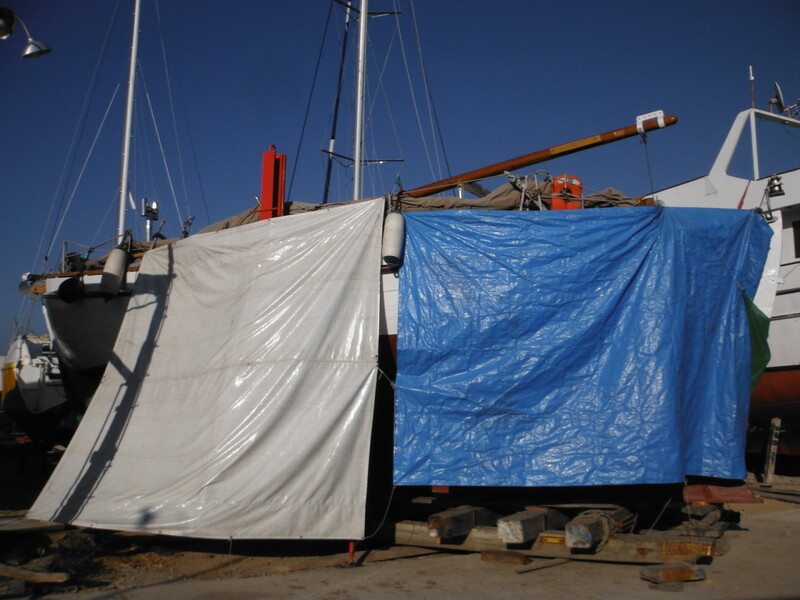 At first Eos was situated next to a high boat providing a lot of shade – good to prevent drying out. But with a cold Easterly wind it got quite uncomfortable. 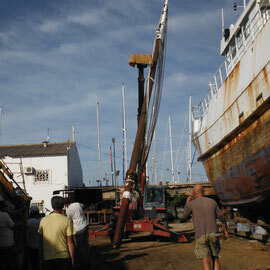 So we were rather pleased to have to make room for another boat to be hauled out. Eos was moved a bit away from the exposed shore, and next to a big motorboat we were nicely sheltered from the wind and we got more sun. On sunny days (which is most of the time) we keep the sunny side covered. But when it rains and blows we take away the flapping flaps so Eos can show herself. 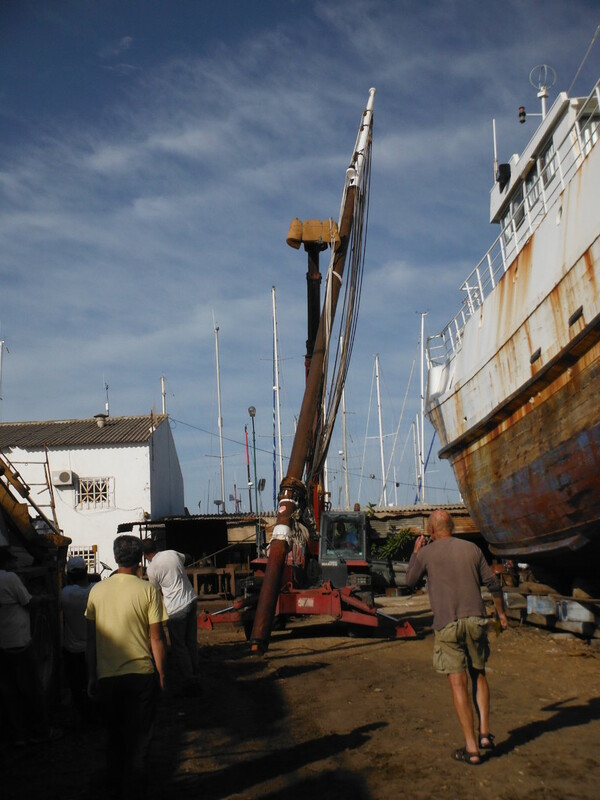 Finally, after several coats of varnish/paint/oil, some new halyards, lights and electric cables, the mast was ready to be raised again. 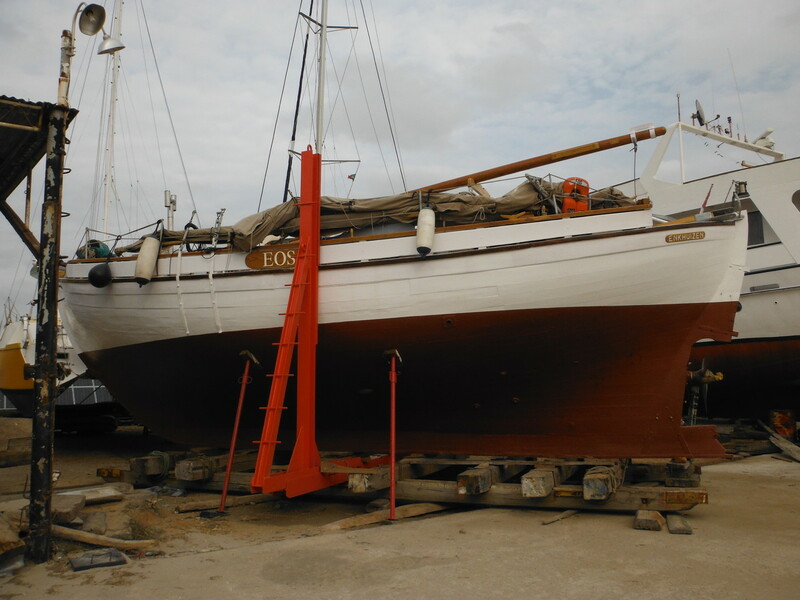 When we'd first stepped the mast we'd put some good luck coins under the foot: one of the life boat association KNRM, a Henkuzer Herinkie from our home port, a Norwegian 5 øre piece of the year 1932 and a Beatrix guilder of pre-euro times. Now we added a Portuguese coin; we couldn't find a 2013 one so we made do with the most recent, a cent from 2012. 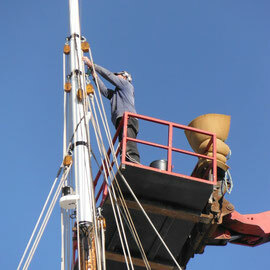 Eos' VHF antennas are fitted in a too complicated way to just disconnect and connect them again, so Peter had to go to the mast top to put them back in position. 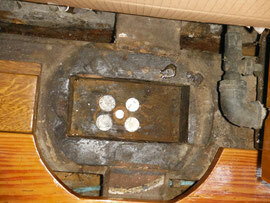 And of course, some blocks were the wrong way around and had to be redone.